PARIS (Reuters) - Renault (RENA.PA) expects to deliver sales growth in 2019, despite the imminent ouster of Chairman and Chief Executive Carlos Ghosn and tension with alliance partner Nissan <7201.T>. "Volumes progressed across almost all our regions (in 2018), and we're entering 2019 with expectations for a slight increase in sales," Renault sales chief Olivier Murguet told reporters. Murguet declined to comment on the leadership crisis engulfing Renault-Nissan following Ghosn's arrest in Japan for alleged financial misconduct or any sales impact it may have. The French carmaker posted a 3.2 percent increase in vehicle sales last year, boosted by a new Chinese joint venture and rebounding demand in Russia and Latin America. The Renault board and its nominations committee are expected to meet within days to consider potential successors including Michelin (MICP.PA) CEO Jean-Dominique Senard, senior Toyota <7203.T> executive Didier Leroy and Ghosn's Renault deputy Thierry Bollore, sources have told Reuters. Ghosn has been charged over allegations he failed to disclose close to $80 million in additional compensation for 2010-18 that he had arranged to be paid later. Nissan director Greg Kelly and the company itself have also been indicted. Both men deny the deferred pay agreements were illegal or required disclosure, while former alliance boss Ghosn has denied a separate breach of trust charge over personal investment losses he temporarily transferred to Nissan in 2008. 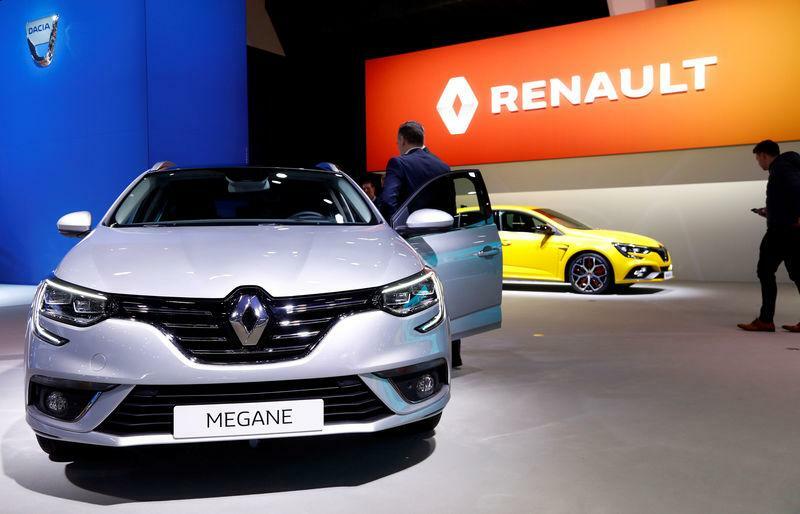 Renault's sales rose to a record 3.88 million vehicles last year - including some 166,000 sold through its new partnership with China's Brilliance (1114.HK). Global sales excluding the joint venture fell 1.2 percent. The carmaker only narrowly avoided being overtaken by arch-rival PSA Group, outselling the Peugeot maker by 6,530 vehicles. Unlike Renault, PSA avoided major disruption from tougher new "WLTP" emissions tests introduced in September, and increased sales 6.8 percent to 3.88 million vehicles in 2018 thanks largely to its acquisition of Opel-Vauxhall. Renault's share of the European passenger car market shed more than one point to 9.8 percent in the fourth quarter, from 10.9 percent a year earlier. While the global sales decline - excluding Brilliance - reflected setbacks in Turkey, Iran, China and India, Renault nonetheless outperformed a weak home market, with a 0.5 percent gain in European vehicle sales including vans. The company said it expects automotive markets to be "stable" in Europe and globally this year, with Russia growing 3 percent and Brazil expanding 10 percent. Murguet also said Renault had no plans to stockpile vehicles in preparation for Britain's exit from the European Union in March, in case London and Brussels fail to reach an exit deal. "Stockpiling is expensive and short-termist," Murguet said, adding: "we'll take an extremely pragmatic sales approach and adapt extremely rapidly."